Everyone deserves to find the place and the activity where they can truly excel - that's Steve Brown's take on inclusion. "It's not just people with disabilities that always feel they don't quite fit in. For people that maybe struggle with their confidence, their self-belief - whether that's through disability or other things - you've got to find a corner where you feel like you can be yourself, and feel strong." For Brown that corner was found in wheelchair rugby, a sport in which he not only excelled in terms of skill, but one that also took him all the way to captaining the full Great Britain squad at the London 2012 Paralympics. BBC Studios Unscripted Productions had a successful evening, scooping seven awards for a range of its shows including Extreme Wives with Kate Humble for Documentary, Nadiya’s British Food Adventure for Factual Entertainment and Steve Brown from Countryfile for New On Screen Talent, plus a few craft awards for Drugsland, a gritty documentary shot on the streets of Bristol. 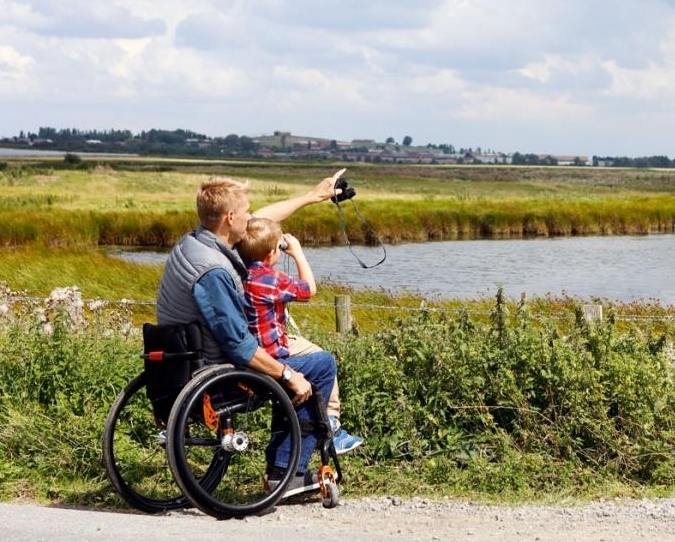 It might not be an obvious choice for many – less des-res than your standard desert island escape – but for British Paralympian, broadcaster and naturalist Steve Brown, the Isle of Sheppey is the perfect escape, and for all the right reasons. As we gradually got to know each of the six, their disabilities didn’t so much recede as simply become part of their individuality. Which in turn made their achievements as a group all the more appreciable, not least in working together to ensure that Steve, as the least able among them, could become the first wheelchair user ever to see the awe-inspiring interior of Hang Chuot. As they travel the Ho Chi Minh trail, it becomes clear that - as campaigners have been trying to explain for years – that much of what we call disability is socially constructed. In a mildly modified jeep, it doesn’t matter how many working limbs drivers Steve or Vicky have. It only matters that reading directions is not Mary’s strong suit. It is the steps that slow Steve’s progress down to the river. If there had been a ramp, he’d have been faster than the rest of them. Strangers’ stares are a function of ignorance – again, an alterable state – while a frank inspection by children early on is a result of simple curiosity. Once they have understood what’s going on, they invite Mary to share one of their bikes, because she is the same size as them. Six Britons are travelling 900 miles through the South East Asian country, on motorbikes and in a four-wheel drive. For each one of them, the struggles are familiar to anyone who's journeyed in that part of the world: mosquitoes, mysterious food, a baffling language and people who stare. Each one also faces a personal challenge, from profound deafness to dwarfism to missing limbs, and while, in the first part of the journey, those didn't deter anyone, they could certainly not be glossed over either. Steve Brown’s life could have ended before it had really begun. When he was 24, a fall from a friend’s first-floor balcony – “I wasn’t larking around, I just tripped and fell” – left him with a broken neck and paralysed from the chest down. Though physical steps are impossible, professional ones are what drive him. And the one he’ll take on Sunday is very special: his debut as a Sunday-evening Countryfile presenter will be one in the eye for the school careers advisor who told him at 15 to give up on his dream. Steve Brown was in bed at Stoke Mandeville Hospital in 2005 when it was announced that London would host the 2012 Olympic and Paralympic Games. A month earlier, while working as an area manager for a holiday company in Cologne, Steve had lost his balance on a first-floor balcony and fallen 12ft to the ground below. Great Britain’s Wheelchair Rugby captain Steve Brown has a wicked sense of humour. When a Blue Peter presenter took part in a training session with the squad two years ago, he advised him to “lean forward when you’ve got the ball, to protect it.” Blue Peter shouldn’t have taken that tip at face value. For Steve, his new life would have come as even more of a surprise: he is now captain of the Great Britain wheelchair rugby team. It is a life that he is fully committed to. He needs to be: as the Paralympic Games approaches, the training regime is tough. As well as playing rugby four times a week, Steve goes swimming twice-weekly and puts in six sessions at the gym. This is a full-time job, only made possible through funding from UK Sport, the National Lottery, a Sky Sports scholarship and support from numerous local charities. Kent Paralympian Steve Brown says it is an honour to be named as captain of Great Britain's wheelchair rugby team. The 30-year-old from Sittingbourne missed out on selection for the Beijing Games four years ago. "Being selected to captain my team through the Paralympics is such an honour," he told BBC Radio Kent. "Going full circle from not being selected at Beijing and now being selected and appointed to captain the team is a big difference." Murderball was what wheelchair rugby was originally known as but the pain suffered by Britain's captain means he dismisses any notion of brutality as he prepares for this summer’s Paralympic Games. Steve Brown has suffered two life-threatening injuries, one which led to his taking up the sport and the other which nearly ended his involvement in it, but he remains modest when asked to describe the intensity of wheelchair rugby. “Dangerous is a little bit of an overstatement,” says Brown of the sport which involves ramming opponents. Players score by carrying the ball across the goal line. Brown has been paralysed from the chest down for the past five years after falling from a balcony and breaking his neck. He was depressed, angry and scared, but through the care of his doctors and physiotherapists at Stoke Mandeville Hospital and with the encouragement of the Spinal Injuries Association, one of The Times’s Christmas charities this year, he has turned himself into one of Britain’s elite sportsmen and hopes to represent his country in wheelchair rugby at the Paralympic Games in 2012.